These items appear IN VaRIOUS LOCATIONS ON THE HOME PAGE. Description: Planning for sustainable water management practices to support the river and other users into the future. Description: DRC's transfers program acquires and transfers water rights to be permanently protected instream. Description: Sharing water to meet the modern needs of rivers, cities, and farms. Title: Promoting more efficient irrigation practices. Description: The Deschutes Basin is over-allocated. We work cooperatively in the basin to restore flows in local streams. Description: The DRC Groundwater Mitigation Bank creates temporary credits through instream leases. Description: Living in the high desert, we all rely on the Deschutes River and its tributaries. When we began restoring streamflow and improving water quality over 20 years ago, the landscape looked much different. Whychus Creek in Sisters ran dry in the summer, the Middle Deschutes, downstream from Bend had only 20% of the flow it has today, the Crooked River downstream from Smith Rock suffered from low flows and high stream temperatures. Description: 7 tips for conserving water in and around your home. Description: Be part of river restoration in Central Oregon. 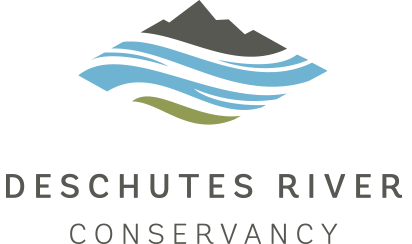 Description: Check here for opportunities to volunteer for the Deschutes River Conservancy.